The Winter Olympic is taking is occurring this year and it is taking place in Pyeongchang County, South Korea, on 9 of February - 25 February 2018. 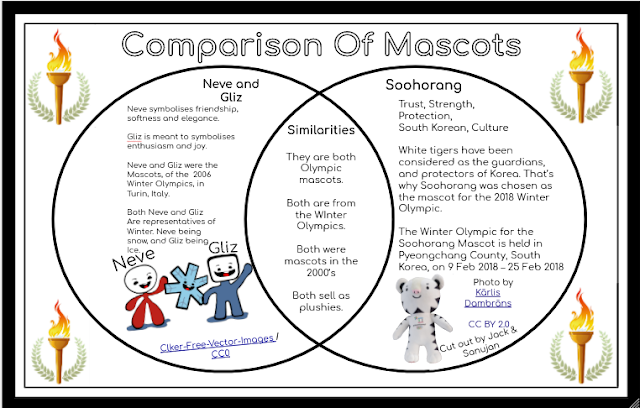 This week for Inquiry were creating a Comparison of the Winter Olympics' Mascots. I worked collaboratively with Jack, Nickaela and Brooklyn. Our task was to create a Venn Diagram. After that spent a few minutes searching for some Winter Olympic Mascots. The Mascots we compared were, Soohrang, and Neve and Gliz. Did you know that the Soohorang was selected as the mascot because the Soohorang represents a white tiger and white tigers have been the protecters of Korea for a long time.